Bright spark Imogen Stidolph has had the chance to see her artwork shine in a London exhibition. 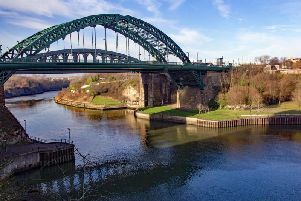 The 15-year-old Whitburn Church of England Academy pupil took part in the national Economic and Social Research Council’s Better Lives photography competition. It challenged young people to take a picture to show what the term ‘better lives’ means to them. The teenager entered the ‘better health’ category and submitted an image called ‘Light’ - a silhouette which she had created out of a string of lights. She explained: “I used a set of yellow/orange coloured lights to create the outline of a face and then, also using the lights, I created the brain/mind to look quite messy, to represent confusion. Judges, who had to sift through more than 800 entries, were so delighted with Imogen’s submission it was included in a recent exhibition at London’s Espacio Galley - which she was invited to go and see. Teacher Carla Craig said: “I believe this was an amazing opportunity for Imogen and I’m really proud of her and her hard work. “She always comes to lessons very keen, focused and ready to learn. Imogen’s dad Deryck was delighted to visited the capital with her daughter and see her art, and name, on display.